Slane Castle is celebrating today the final granting of planning permission to proceed with a whiskey distillery within its historic grounds. It's a €12m development that will create 25 full time jobs in the distillery and visitor centre. 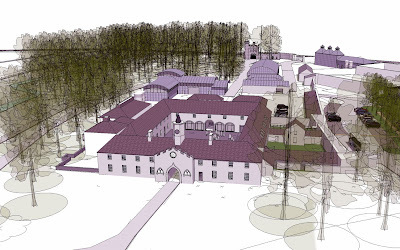 The site is just 110m to the northwest of the castle and will involve the restoration and adaptation of existing 18th Century courtyard and stableyard buildings. Construction will begin later this year. For distilling advice, Slane will be able to draw on the expertise of their co-investors, Camus Cognac, as well as that of external consultant, Roy Court, of Longcourt NPD. The company plans to produce triple-distilled single malt (made entirely from malted barley), triple-distilled single pot still (made from barley, malted barley and - an Irish tradition lost until now - oats), and blended whiskey (a combination of malt or pot still, and grain whiskey). Making grain whiskey requires a column still, an unusual feature for a craft distillery in these parts. Slane will have one, alongside their pots. Besides allowing the production of lighter, blended whiskeys, it should also allow them to get something on the shelves sooner. They anticipate a blended whiskey as early as 2018, when it couldn't be more than 4 years old. The pot still and malt whiskeys will need a little longer before bottling. Unlike other Irish distilleries, the aim is to make the grain whiskey from barley, rather than from imported maize. Barley is an important part of the Slane Castle whiskey story. The estate will grow 2,000 tonnes of barley for itself. That should more than cover initial annual production of 600,000 LPA (litres of pure alcohol) per year. Output can be increased to a maximum of 1m LPA/year, which would require about 2,900 tonnes of barley/year. The extra grain would come from local farms within a few miles of the distillery. Uniquely among Irish distilleries, Slane will malt its own barley on site. It will use a mechanised version of the traditional floor maltings once common in Ireland, known as a Saladin box. You can see the signature "pagoda" roofs of the malthouse in the architectural drawing below. Used for venting hot air and smoke from the malting process, they are sometimes added as decorative flourishes to new distilleries as a visual cue for visitors. They will catch the eye of passing motorists here too but it is nice that they will once again have a functional purpose in an Irish distillery. Slane will also experiment with roasting barley. Drawing courtesy of Slane Castle Distillery. Click to enlarge. The pot and column stills are all coming from John Dore & Co in England, though the specifications have not yet been finalised. I've mentioned this company before on Liquid Irish. It's the successor to Aeneas Coffey's original business and it made the old, unused, copper Coffey still you can see at Kilbeggan Distillery today. We won't have to wait until 2018 to taste the spirit. The visitor centre will open in Spring 2015 and will offer samples of the maturing spirit. If you like how it's developing, you will be able to invest in a whole cask. Alex Mount Charles, Managing Director. 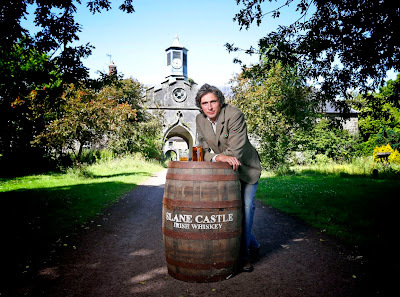 Photo courtesy of Slane Castle Distillery.